Matched in SEARCHING FOR ALWAYS–Review and Giveaway! Hi there! 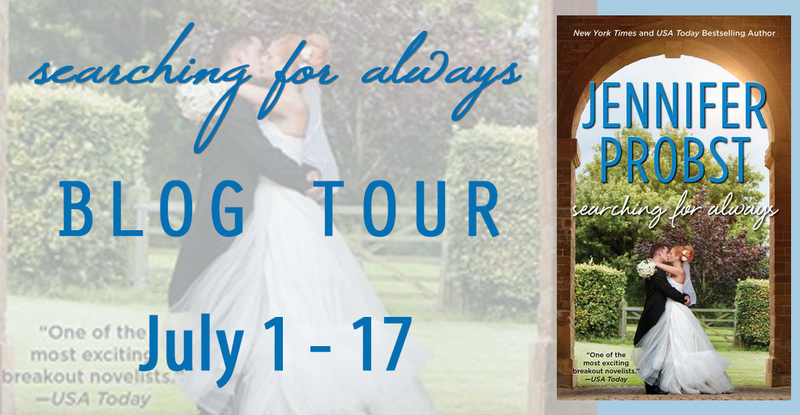 Today, I’m sharing of SEARCHING FOR ALWAYS by Jennifer Probst. This is the 4th book in the Searching For series and it is published by Gallery Books. I recently reviewed SEARCHING FOR BEAUTIFUL and had to continue with the series. SEARCHING FOR ALWAYS features the love story of Arilynn, yoga teacher, counselor and rescuer of dogs everywhere! Can this do-gooder save the heart of alpha male Officer Stone Petty, meat-eating, stress-case, extraordinaire? Check out the teaser and giveaway below. This is the 4th book in a series, but able to be enjoyed as a standalone. Officer Stone Petty is a cop with an anger problem, sent to Arilynn’s 6-week anger management program for counseling after a brutality incident. (He beat up a domestic abuser he caught beating the heck out of his wife and child.) As it turns out, Stone is extremely sensitive to domestic abuse as an abuse survivor. He’s also a meat-loving, fast food scarfing, dog-hating recent ex-smoker, and totally wrong for Arilynn–so why are they attracted to each other? This is low-conflict odd couple romance with lots of heart and some good heat. I really enjoyed the alternating POV, with the large swing in emotions. Stone has a lot of emotional scars, and he’s quick to judge as a result. He is a big proponent of justice, and I liked his remorse regarding the incidents that led to his discipline. I think readers will find kinship with a man having a violent response to child/spousal abuse, even if he’s a cop. Arilynn is a heroine with lofty ideals and down-to-earth solutions. She works hard to channel her frustrations with Stone, who is REALLY difficult to work with as a client. Setting her attraction aside, he’s constantly challenging her and works hard to make her angry–so their interactions are always a lesson in patience. I rejoiced every time she got the better of him, in class and out of it. I also loved that Arilynn found a man who wanted to treat her right and never considered keeping her a secret, like Jacob had. They have some excellent passionate moments, and delicious sexytimes occur after they’ve been in contact daily for a few weeks. They start out, intentionally, to only be casual partners but it quickly turns into something far more. As this is a series read, we get some of Arilynn’s pals in the mix, but the character interactions are toned down from recent books. This allows for greater development of accessory characters, like Arilynn’s busybody neighbor and her grandpa. Those two are a hoot! Oh, and don’t forget the dogs! Stone has a bad history with dogs and is not best pleased that his anger management includes animal therapy–his experience will melt readers. Pinky is the best, BEST, medicine for his hardened heart. I love the doggy picture! I thought it was a sweet idea to give prizes to animal shelters. There are lots of animal shelter scenes in the book–and one case of gross abuse…so it is fitting.